Located in the midst of a rapidly expanding city, these spaces serve as important and accessible getaways for regular walkers, joggers and nature enthusiasts. 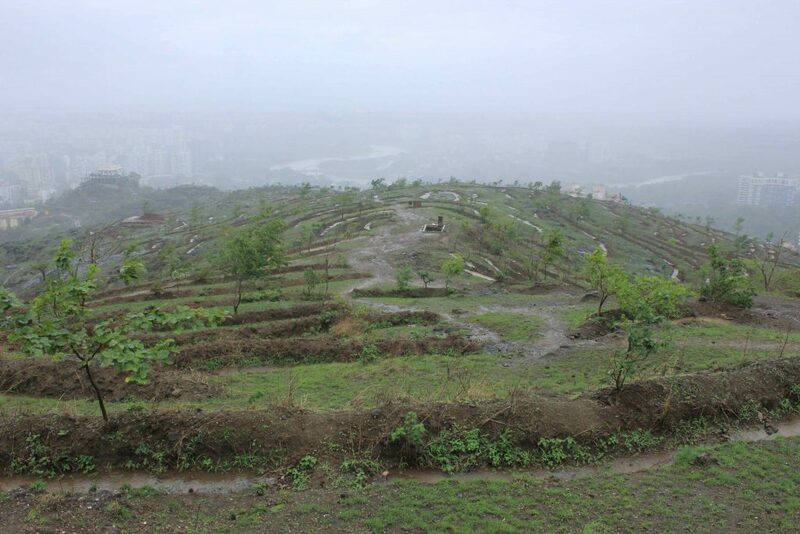 These trap hills are essentially the Vetal and Parvati hill complex, or simply ‘tekdis’, as Punekars know it. Located in the midst of a rapidly expanding city, these spaces serve as important and accessible getaways for regular walkers, joggers and nature enthusiasts. The vested sense of pride and association is so strong among these citizen groups that they have been able to play a significant role in influencing the present and future of these hills. For instance, by vehemently lobbying against the Paud-Balbharti link road that would cut through the hills, these groups have forced the Pune Municipal Corporation to reassess this project. Similarly, the forest department’s plans to build a concrete wall ascertaining its territory and preventing encroachment on the hills have met serious opposition. Restricted access, destruction to the ecology and biodiversity of the hills, as also to the efforts of various afforestation initiatives that have been undertaken by a green brigade of conscious citizens have been the key points of contention. 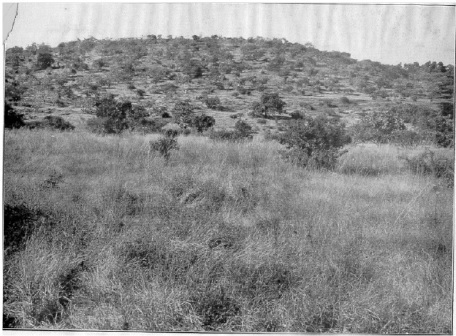 These unsuccessful attempts were replaced by monoculture plantations undertaken by the forest department in the 1950s and a dense stand of an exotic tree species, Gliricidia sepium, had already been reported from the Vetal hill by 1964. On the Parvati hill, there are records of exotic and some indigenous tree plantations installed by the forest department in 1973. These represent a shift in focus from raising trees commercially for timber to shade species that would enrich soil nutrients and provide fuelwood and fodder in the post-independence period. And a further shift, after the 1970s, aimed at demonstrating forestry features and creating forest-parks that would serve as recreation centres for citizens. 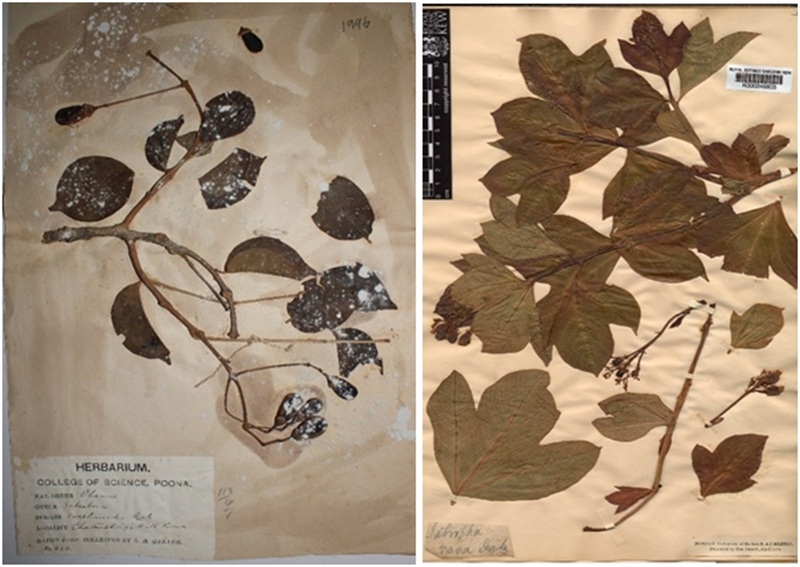 Early publications by botanists and horticulturalists see these as success stories. Statements such as “the original bare hill has been converted to a beautiful natural park” are testament to this. But how much do we know about the ‘original’ status of the hills before these interventions? As it turns out, a fair bit actually! The trees that were most common included Boswellia serrata, Anogeissus latifolia, Lannea coromandelica, Terminalia tomentosa, Cochlospermum religiosum and Pterocarpus marsupium. As is evident in the photograph above, the vegetation consists of dwarf trees and shrubs sparsely scattered through a herbaceous understory. We now know that these are typically savannah ecosystems, where trees and shrubs are embedded into a continuous grassy layer and don’t form a closed canopy – quite unlike typical forested landscapes. Besides, other, more cultural evidence also points towards the existence of a more open, grass-dominated system in the past. The discovery of microlithis – stone tools associated with a nomadic pastoral community, the Dhangars – indicates their use of the hills over the last 2,000-3,000 years for grazing. Additionally, the presence of shrines dedicated to Mhatoba, Khandoba and Vetal, prominent pastoral folk deities, on top of Vetal and adjoining hills further elicits this association. Now, foresters in colonial times valued trees much more than grass and felt that livestock grazing disturbed their forestry activities. This mindset of valuing forested landscapes over naturally open, sparsely-treed ecosystems undoubtedly trickles deep into our bureaucratic setup even today. However, such thinking is not limited to the forest department; more recently, it appears to be pervasive. Tree plantations form the core of modern-day environmental movements, particularly as a means to tackling climate change. 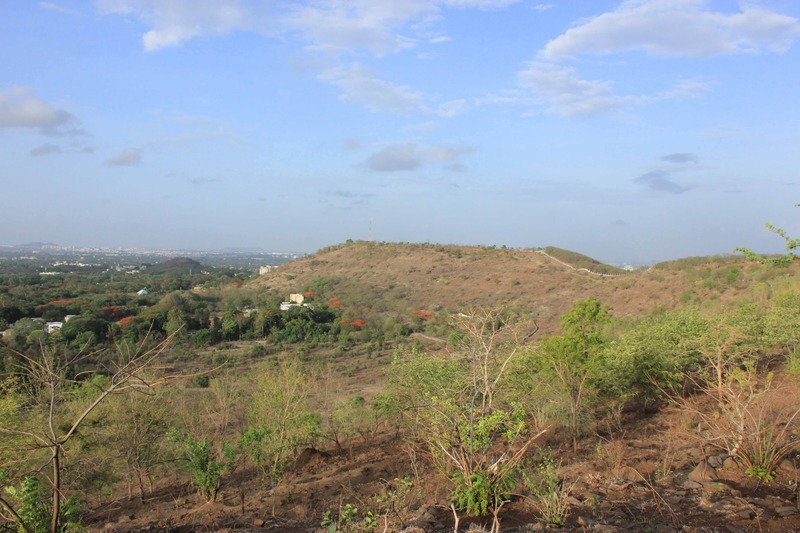 In the last decade, a fresh wave of afforestation activities, led by NGOs and citizen groups have made their mark on the hills of Pune (see here, here and here). The common species that have been preferred and used have been listed by one such group. These include some native to India as well as exotics like Gliricidia (Gliricidia sepium) and Subabul (Leucaena leucocephala), the latter considered to be one of the most invasive plants in the world. These activities are changing the fundamental nature of the ecosystem i.e. transforming it from a more open, mixed tree-grass system to a woody forest, and these changes could gradually wipe out extant, local biodiversity. For example, a study comparing the floristic surveys conducted for the tekdis between 1901 and 1997 recorded the loss of 72 native species, most comprising tuberous herbs (Dipcadi montanum, Ceropegia bulbosa, Habenaria longicalcarata, etc.) and some deciduous trees (Schrebera swietenioides, Garuga pinnata, Buchanania lanzan, etc.). We also know that some of the above mentioned species perform poorly in shaded environments and need bright-light conditions to grow. 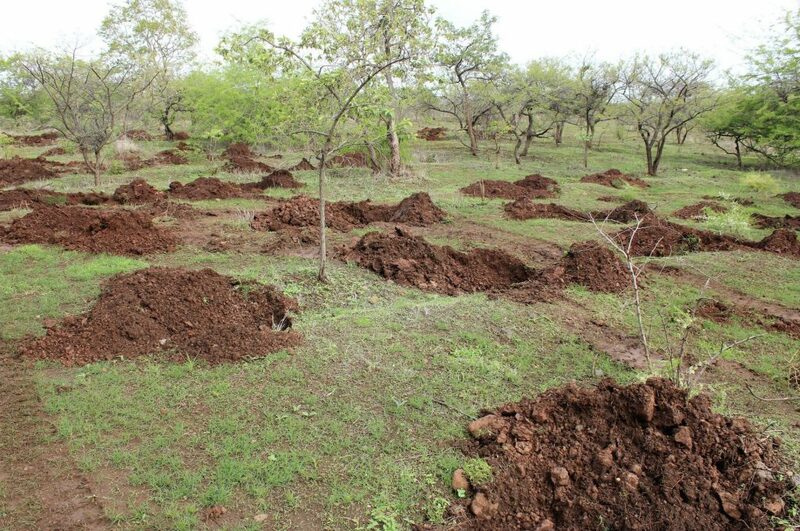 Additionally, disturbance to the topsoil from activities like contour trenching may lead to a loss of species that use the shallow soil depths (e.g. tuberous herbs, grasses), as also the loss of a treasured seed bank that holds a key to the vegetation of the future. The current approach towards uplifting the face of the hills is possibly based on the notion that open, low tree-cover systems are ‘degraded’ and ‘barren’ i.e. not quintessentially forest. However, historical evidence from the last few centuries indicates that the hills have indeed supported such open ecosystems, especially those plants adapted to more dry climatic conditions and a thin soil layer. Dry, deciduous trees will shed their leaves in the dry season and grasses will dry out. The hills will naturally not look lush and green year-round. That is the biological nature of the system! In this race to green the hills, we will slowly lose vegetation that is essentially characteristic of such landscapes and, in the process, possibly other dependent biodiversity as well. As citizens, we must seriously begin to debate whether and how much we want to intervene and further manipulate the hills’ vegetation. We must keep in mind the rich ecological and cultural history of the land. Given that we have access to resources that point us to the hills’ native vegetation, we have provided a list of some species that can be planted if doing so is absolutely necessary. Priyanka Runwal grew up in Pune and is now a researcher affiliated with the National Centre for Biological Sciences, Bengaluru. She works on the socio-ecology of arid grassland and savanna landscapes. Ashish Nerlekar is a Pune-based botanist and ecologist, interested in savanna ecosystems. He has studied the ecology of Jatropha nana, a threatened plant found on Pune hills.